Oklahoma Connection | Conkling came to Perry, Oklahoma, in 1900 as a manager for the Oklahoma City Telephone Exchange. While in Oregon, Madeline B. Conkling was the youngest woman ever at the time to be elected worthy matron of the Order of the Eastern Star. Madeline Burwell was born in Pennsylvania in 1865 and attended Meadville University. After beginning her teaching career, she moved to Kansas and taught for four years before marrying a fellow teacher, Roscoe Conkling. The next decade was spent in Oregon teaching and serving as superintendent of schools in Roseberry. In 1900, she found herself taking charge of the Oklahoma City telephone exchange and held that job for four years before her health forced her to abandon a business career until 1913, when she accepted a similar position in Checotah, Oklahoma. 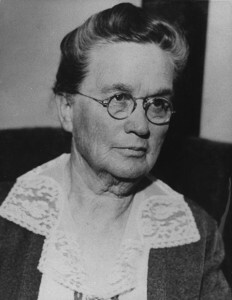 She moved again in 1915 to the same post in Wyoming and served there until 1919, when Oklahoma Governor Robert L. Williams appointed her as superintendent of the State Industrial School for Girls. In 1921 she moved the school to an area near Tecumseh, built its grounds into a garden spot and succeeded in removing the appearances of a correctional institution. She managed her school so successfully that it became nationally known and was rated higher in standards than similar institutions in 16 states. “Mother” Conkling credited her success to the idea that although “it was a prison school, it was run by love.” In 1931, Mrs. Conkling resigned after the election of Governor William H. Murray and temporarily retired. The following year she became superintendent of the Oklahoma County Girls Home and held that post until her death five years later.